It’s been a while since I’ve done a beauty post, so I thought I would share with you some of the products that have been on repeat for me this fall season. 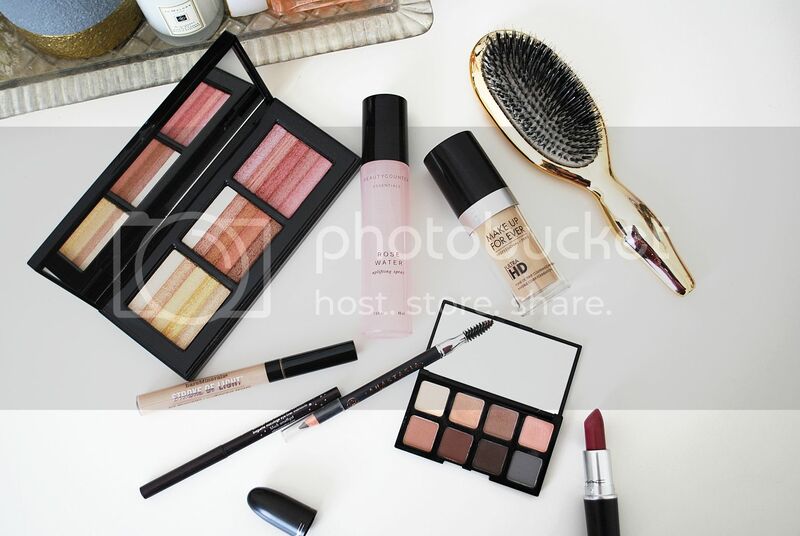 I tend to stick to products that are easy to travel with, simple to apply and go well with the colors of the season. It can get tricky switching over to makeup that goes well with your “fall & winter” skin tone as I personally usually loose my tan olive glow and become a little bit paler. (Isn’t it the WORST loosing that summer tan?!) All in all, I think I’ve found just the right combination of products this fall season that give my skin the perfect glow. I always start my makeup routine with a fresh clean face and a spray of Beautycounter’s Rose Mist Spray. It’s the most refreshing way to start the day and helps your face stay hydrated and your skin glowing. 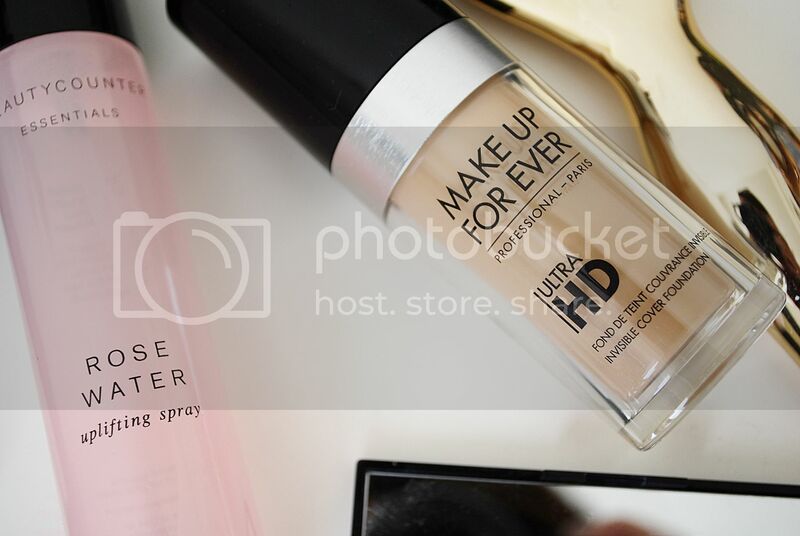 When it comes to foundation and powder, I always have to switch to a lighter color in the fall and winter months. When I first tried this Make up For ever HD invisible foundation I was so shocked at how well it blended into my skin, giving me just the right amount of coverage without being to heavy. It stayed on all day without leaving me oily and I always say thats a plus! 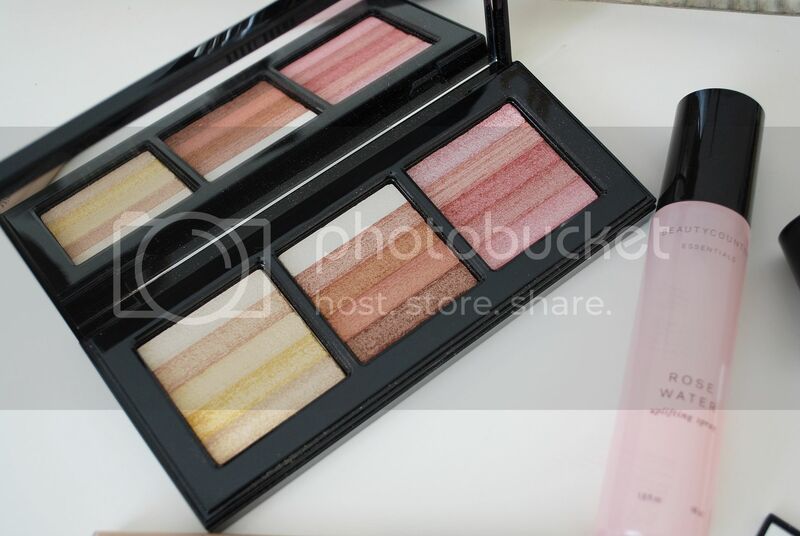 When it comes to just the right amount of shimmer on the cheeks, I’m obsessed with the Bobbi Brown shimmer bricks. They just came out with this limited edition palette where you get three different shimmer colors in one. Such a good deal and such beautiful colors. I’ll put the bronze shimmer lightly all over my face and neck to add a little color, swipe the light pink color on the middle of my cheeks and highlight the top of my cheekbones with the light gold color. Beauty PERFECTION. I’m constantly buying lipsticks. I might have a problem. But the thing is, I wear them. A LOT. I’m currently loving this fall color by MAC called “Captive” because it’s the perfect shade of raspberry pink for fall. 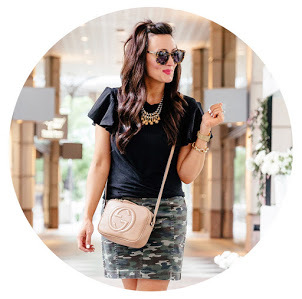 It matches well with all fall wardrobe colors, including neutrals, olive greens and even burgundy. Some of my other go-to favorite MAC colors are “Faux“, “Mehr“, and “Plumful“. Under my eyes I’ve been loving using this eye brightener that really make you look awake and ready to go in just one swipe. 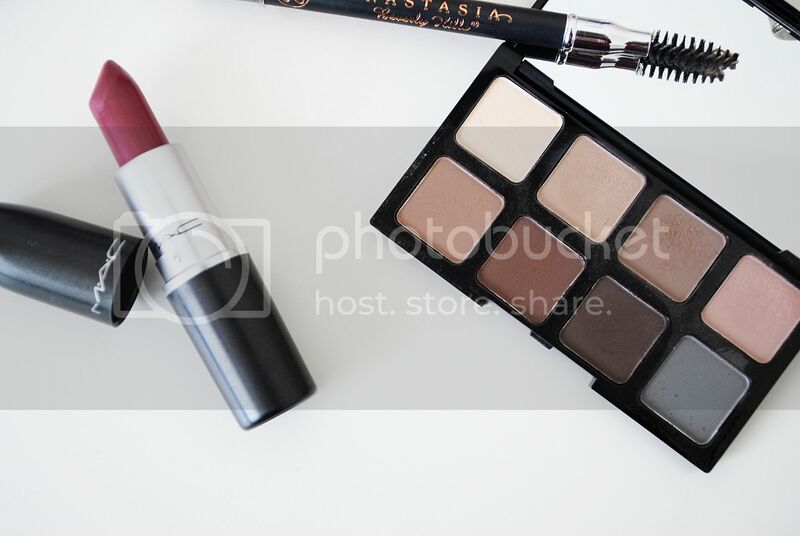 I’ve also been using this neutral eyeshadow palette constantly as I find the colors to be the perfect shades of brown and I love the way the matte colors look on the eyelid. It’s also the best for traveling as it is compact but gives you so many different color options in one palette. 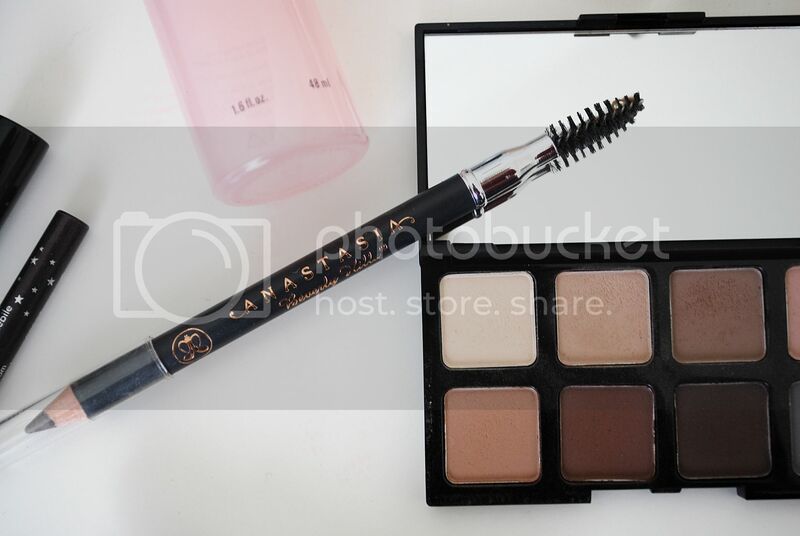 For eyeliner, the Stila waterproof eyeliner goes on smooth and easy and I love the way it makes my eyes pop when mixed with the brown tones of the Smashbox eye palette. For the past year or so, I’ve been using Benefit’s Gimmer Brow gel (which I loved), but I wanted to switch it up and try something new last month when I ran out of the gel. I switched over to the Anastasia brow pencil and realized it makes my brows perfectly stand out and really helps shapes my face. It’s a great brow pencil and I’ll probably stick with it for a while. Well, there you have it, my favorite fall beauty items that I can’t stop wearing as of right now. What are your go-tos? Favorite lipstick colors for fall? I’d love to hear. Leave me a comment below!